The schematic at top illustrates the co-sintering of ceramics and 2D materials using the novel cold sintering process. At bottom are a transmission electron microscopy (TEM) image (left) and energy dispersive spectroscopy (EDS) map (right) of a cold sintered MXene:ZnO nanocomposite, showing that the MXene nanosheets are distributed homogeneously along the ZnO grain boundaries. Image: MRI/Penn State. For the first time, researchers have created a nanocomposite made from a ceramic and a two-dimensional (2D) material, opening the door for new designs of nanocomposites for applications in solid-state batteries, thermoelectrics, varistors, catalysts, chemical sensors and much more. Sintering uses high heat to compact powder materials, including ceramics, into a solid form. Widely used in industry, ceramic powders are typically compacted at temperatures of 1472°F or higher, whereas many low-dimensional materials cannot survive at those temperatures. 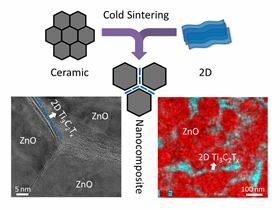 Now, a novel sintering process developed by a team of researchers at Penn State, called the cold sintering process (CSP), can sinter ceramics at much lower temperatures, less than 572°F, saving energy and allowing the synthesis of a new form of material with high commercial potential. "We have industry people who are already very interested in this work," said Jing Guo, a post-doctoral scholar working in the group of Clive Randall, professor of materials science and engineering at Penn State. "They are interested in developing some new material applications with this system and, in general, using CSP to sinter nanocomposites." Guo is first co-author of a paper on this work in Advanced Materials. The idea of trying to develop a ceramic-2D composite system came out of a US National Science Foundation workshop on the future of ceramics., which drew 50 of the top ceramic scientists in the US, including Yury Gogotsi, director of the A.J. Drexel Nanomaterials Institute at Drexel University. Gogotsi heard Randall's presentation on cold sintering and proposed a collaboration to develop a ceramic composite using a new class of 2D materials called MXenes, discovered by Gogotsi and his collaborators at Drexel. MXenes are carbide and nitride sheets a few atoms thick that possess extreme strength; many of them are also excellent metallic conductors. While it has been known that mixing even a very small amount of a 2D material such as graphene into a ceramic can dramatically change its properties, MXene has never been used in ceramic composites. In this work, Guo and Benjamin Legum, Gogotsi's doctoral student, mixed 0.5–5.0% MXene into a well-known ceramic system called zinc oxide (ZnO). The metallic MXene coated the ceramic powder and formed continuous 2D grain boundaries, which prevented grain growth and increased the conductivity by two orders of magnitude. This transformed the semiconducting ZnO into a metallic ceramic and doubled the hardness of the final product. The addition of MXene also improved the ability of ZnO to transform heat into electricity. "Ben came here quite frequently to work with Jing, and over time they overcame all of the problems involved with dispersing the 2D MXenes into the zinc oxide and then sintering it," said Randall. "This opens a whole new world incorporating 2D materials into ceramics." "This is the first ceramic composite containing MXene," added Gogotsi. "Taking into account that about 30 MXenes with diverse properties are already available, we are opening a new chapter in research on ceramic matrix composites, with potential applications ranging from electronics to batteries and thermoelectrics."